Plans are moving forward to establish an "Education Hub" in St Ives - with a range of courses. on Friday 12th and Saturday 13th May. More details of this to follow. Workers Educational Association (WEA) Cornwall are taking the lead on this - with courses at St Ives Library, St Ives Infant School and The Island Centre. 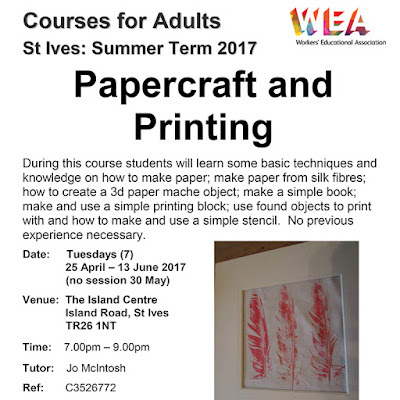 Creative Textiles - with Jo McIntosh - starts on Wednesday 19th April and runs every Wednesday for nine weeks at St Ives Library. Adult Theatre Workshops - with Miracle Theatre - start on Saturday 22nd April and run every Saturday morning for five weeks at St Ives Infant School. 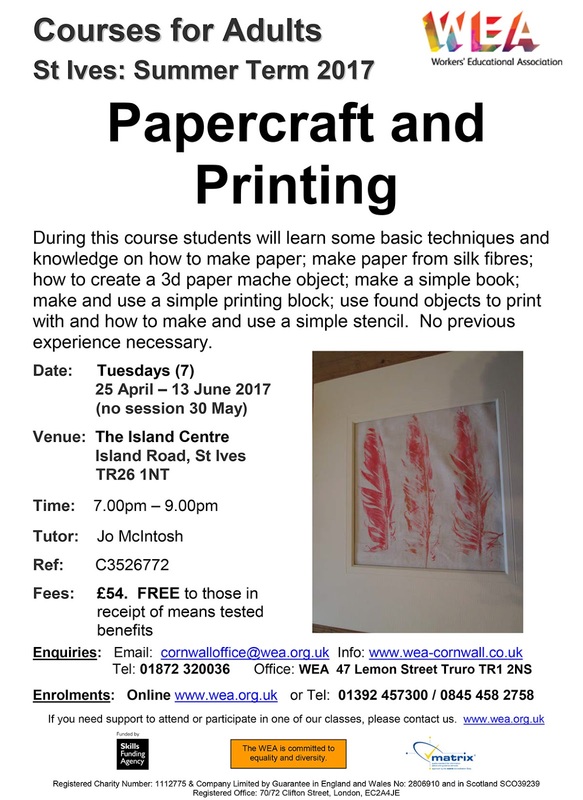 Papercraft and Printing - with Jo McIntosh - starts on Tuesday 25th April and runs every Tuesday evening for seven weeks at The Island Centre. 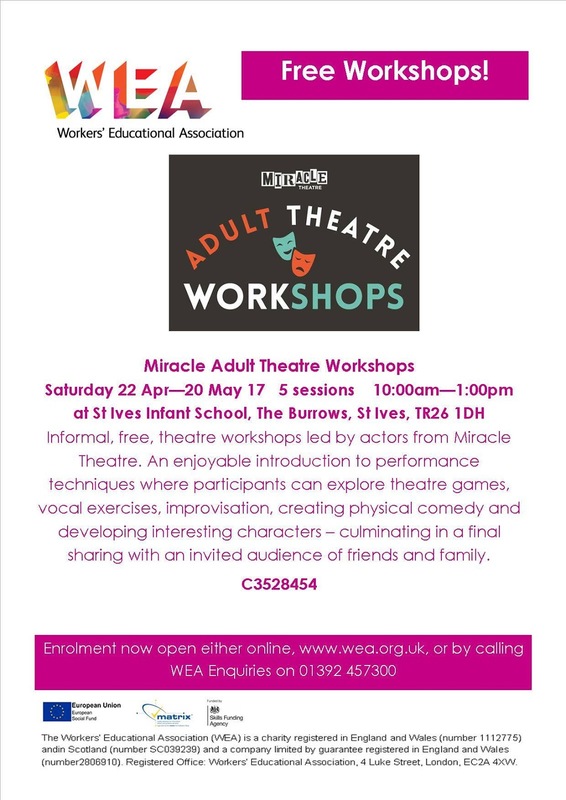 Places on Creative Textiles and Adult Theatre Workshops are free to all. Places on Papercraft and Printing are free for those receiving means tested benefits and cost £54.00 for others. Although some places are free - these courses need your support - you must book - you cannot just turn up on the day. If there are not enough bookings they will not run. WEA Cornwall have obtained funding but need enough students to justify running them. Details of how to book are below. Starts on Tuesday 25th April. A seven week course - weekly on Tuesdays- 7.00 to 9.00 pm. Cost - £54.00 for 7 sessions. FREE to those in receipt of means tested benefits. 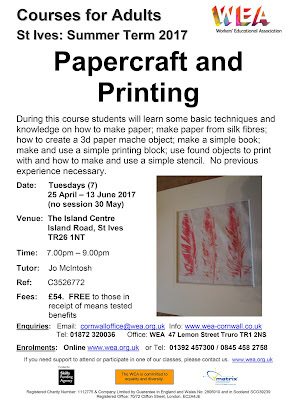 Learn techniques to make paper. How to create a 3D papier mache object. Make paper from silk fibres. Make a simple book. Make and use a simple printing block. Use found objects to print with. How to make and use a simple stencil. Start on Saturday 22nd April . A five week course - weekly on Saturdays - 10.00 am to 1.00 pm. FREE to all - but you must book.